The arguments object is available only inside a function body. Attempting to access the arguments object outside a function results in 'arguments' is undefined error. Though you can index the arguments object like an array, it is not an array. It does not have any Array properties except length. For example it does not have the sort() method, that the array object has. 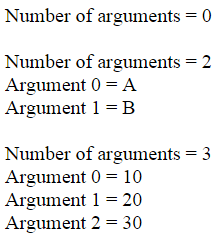 However, you can convert the arguments object to an array. To get desired output, you need to pass in a function which computes how to sort the numbers.